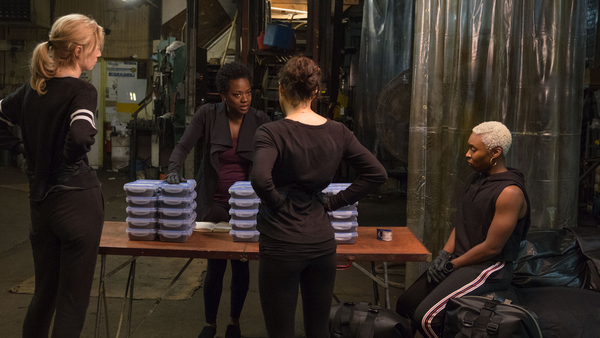 From Oscar®-winning director Steve McQueen (12 Years A Slave) and writer Gillian Flynn (Gone Girl) comes Widows, a stark yet ferociously entertaining heist thriller about four women who refuse to submit to their circumstances when left with the consequences of their dead husbands' crimes. The 17:30 screening on Mon 19 Nov will include Descriptive Subtitles and an introduction from Liz Chege. Liz is a film curator, critic and programmer and a founding member of Come the Revolution, a collective of creatives and curators committed to exploring Black life, experience and cultural expression through cinema. The introduction will feature simultaneous BSL (British Sign Language) interpretation. Following the screening please join Liz for a post-show discussion with other audience members. The post show discussion will take place in the Café/Bar and will feature simultaneous BSL (British Sign Language) interpretation. Veronica (Viola Davis), Alice (Elizabeth Debicki), Belle (Cynthia Erivo) and Linda (Michelle Rodriguez) are plunged into grief after their husbands are killed in a job gone wrong. There's little time to mourn, however, when Veronica discovers her husband (Liam Neeson) left behind a $2 million debt - and the gangsters he stole it from want it back. With a backbone of iron and a fierce determination to prevail, she calls on her fellow widows to put on their battle armour and pull off an epic first (and final) job. Touching on themes of poverty, prejudice, and power, this Chicago-set crime saga is a rare thing - rattling, rewarding, witty and really, really good fun. Enjoy. From 20:00 please join us for Deaf Conversations About Cinema, an informal discussion about the themes of the film in the Café/Bar featuring simultaneous BSL (British Sign Language) interpretation (Deaf and hearing audience members are both most welcome). You’ll receive 10% off drinks with your cinema ticket – so grab a glass and let us know your thoughts about Widows. From Oscar®-winning director Steve McQueen (12 Years A Slave) and writer Gillian Flynn (Gone Girl) comes this stark yet ferociously entertaining heist thriller about four women who refuse to submit to their circumstances when left with the consequences of their dead husbands' crimes.